The future isn’t what we thought it would be. We don’t walk around in silver suits, travel to colonies on Mars or drive in flying cars. Instead, we dress casual, take selfies and communicate in 140 characters. Yet in many ways, we’re much better off than we imagined. Rather than a Mad Max dystopia of war, famine and disease we are safer, richer and healthier than we’ve ever been. 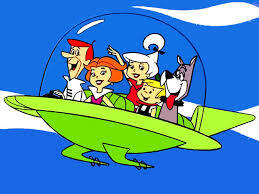 As I’ve argued before, in a very real sense 140 characters are better than a flying car. That’s the funny thing about the future. It’s never as fantastic as we hope nor as horrible as we fear. What do you think? Has the future lived up to our expectations? Perhaps it depends on where and when you are. While I enjoyed the entire post, the last line in the quote above stayed with me. I wondered, Is that really the funny thing about the future? Could these words have been written In Germany in 1945 or NYC in October of 2001 or in early 21st century North Korea? Is the future “never… as horrible as we fear”? My grandfather was never fully convinced that we had traveled to the moon and back. Too fantastic. Is the future never as fantastic as we hope? I wonder if these words could have been written in the labs where they created the first synthetic life forms in 2010? What’s more fantastic? A flying car or the creation of life in a lab? 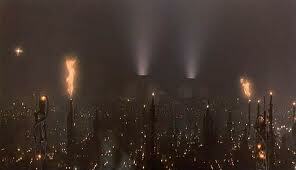 True, Our experience may not match Bladerunner or the Jetsons, but 2014 is both fantastic and fearsome. We create life. Soon we will exercise the power of resurrection and bring back an extinct species. Fantastic. The global slave trade thrives and human slaves populate the dark corners of human civilization. Terrifying. The real sticking point, I think, is the word “never”. It brings to my mind one thing we should all know about the future: We cannot predict it. There may be coming around the corner something even more fantastic than we’ve ever dreamed and/ or something more fearsome than we have ever imagined… or not. Keep your options open and stay alert. Thanks for this. I’ve been pondering James Carse’s comment these last couple of days, how prediction is a reverse form of explanation – explanation being a form of control, end of argument. Your last comment calls on us to live with courage and generosity. Control over the future is, of course, an ancient human desire… witchcraft, astrology are ways in which we have tried to exert this control. Strategic planning can be another way to try to control the future, when it fails to recognize that to execute a strategic plan without a hitch requires that nothing change when the plan is created. Strategic preparedness, in contrast, assumes that things will change.